It starts with a girl, because for many a guy, that’s where life lessons often begin. I say kingdom because the spread was impressive, perhaps 20 feet by 15, and from his perch, her dad controlled it all. Multiple trains, switches, throttles, and on and on. You could tell by the look on his face: He loved this hobby. And nothing on those tracks escaped him. He knew the beginning, end, and everything in-between. This imagery comes back to me because I continue to think we all need some perspective about perspective. It bothers me greatly to see America descending into factions so imprisoning that no one seems capable of understanding anyone else. Soon, the verbal sparring turns into questions of an opponents’ intelligence, and all parties retreat to their corners still attempting murder with words. We have become a people with no ability to step outside ourselves and to inhabit another person’s perspective. Worse, we question the other person’s motives, without any understanding of that person’s past, upbringing, hurts, joys, or hidden beliefs. One of the sad realities I see played out online every day consists of the “enlightened” Christian believer tearing to shreds the novice. The sage must publicly destroy the naïf to show not only the sage’s wisdom but also to defend the honor of God against fools, regardless of how much punishment the supposed fool must endure and its personal cost. And because pounding idiots into the dust is fun. You see, God is not done with any of us yet. Each of us is made in the image of God, yet we are all marred by sin. In our current form, we are flawed, but God can reshape us as He will. And He promises He will if we let Him. When you and I encounter another human soul, we see a slice of a life, a moment in another’s journey. We do not see the departure from the gate, nor the arrival at the final destination. But Father God watches over it all. Like my friend’s dad, He is the celestial engineer who knows the entirety of the track and all that is possible on the journey. He stands apart from time and sees the beginning, the end, and everything in-between. 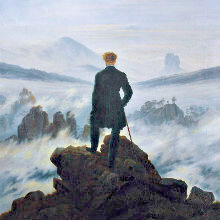 To Him, no surprises are possible, and the ultimate journey of each passenger He knows down to the second. But only the Father knows. Not only can we not know another’s life, we cannot even know our own. We do not know the future. We incorrectly process the past. And we don’t see at all the workings of God in our inmost person. Our life truly is hidden in Him. Which is why it’s such foolishness for any person to presume superiority over any other. We see a fleeting slice of another’s life, but if we try to draw suppositions from that slice, chances are we will miss the truth entirely. We critique another, and the criticism is based on vapor. If each of us cannot comprehend even our own thoughts and lives correctly, how can we be assured of anything about another’s life, especially as to where that person might be in the journey? 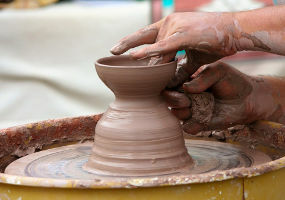 Shall the potter be regarded as the clay, that the thing made should say of its maker, “He did not make me”; or the thing formed say of him who formed it, “He has no understanding”? Ultimately, if we rashly condemn another believer in Jesus and deem him or her inadequate by our standard, we presume to judge God’s working in that person’s life. We stand in judgement over God Himself, questioning His sanctification, His timing, and His thoroughness. This does not mean that if we think that young woman over there is about to throw her life away or that elderly man is slandering someone without cause that we cannot make a judgment in that moment, one that might demand we intervene or correct. But what we cannot do is write them off or think that they are outside of God’s redemption. If we do, then we presume to play engineer and to see all of the track, every train, switch, tree, hill, co-passenger, and all beginnings, middles, and endings. Or in the potter’s case, we question the artistry, the process, and the outcome. We commit the sin of the Garden. We attempt to strip God of His title and instead enthrone ourselves in His place as the engineer or potter. Each one of us is in process. What you see in me now is neither who I was or who I will become. The same for you. For the Christian, the journey is to make us more like Jesus. It’s an effort God undertakes but never completes this side of heaven. Much now is hidden. Only when the End comes, and Christ who is our life appears, will all be revealed. Let’s not break the bruised reed or quench the smoldering wick. Instead, let us partner with God in the journey, whether it’s our journey or another’s. Let’s trust Him that He knows what He is doing in the lives of you, me, and everyone. God’s not finished with any of us yet. Great points, Dan! Enjoyed your comments and the reminder to not look down my nose on my fellow believer. Reading in Romans 14, we find one person thinks it’s okay to eat anything and another eats only vegetables. We’re not to judge either way. One person celebrates everyday as unto the Lord and another sees a certain day as special. Each one is not to judge the other because each one is eating or worshipping the Lord in faith. And we’re not to destroy their faith. We could cause them to stumble. James tells us not to judge our brother or we will fall into God’s judgment. It’s a serious thing to judge our brothers wrongly. The correct way to judge is the type of judgment that would help someone. The wrong way is to condemn, the correct way is to discern so as to help. I needed to hear this admonition!